CITY MULTI® R2-Series: The First Two-pipe System that Simultaneously Cools and Heats. One inverter compressor is all you need. The CITY MULTI R2-Series offers the ultimate in freedom and flexibility. Cool one zone while heating another. Set up zones to maximize simultaneous operation: interior/exterior or eastern exposure/ western exposure. Each zone gets the cooling or heating that's needed at any time. CITY MULTI R2-Series Variable Refrigerant Flow Zoning (VRFZ) System from Mitsubishi Electric's HVAC-Advanced Products Division offers you the ultimate in enhanced comfort and effective energy usage. Mitsubishi Electric's CITY MULTI R2-Series outdoor unit uses inverter-driven compressor (Variable Frequency Drive) technology to provide highly responsive cooling and heating performance. By responding to indoor and outdoor temperature fluctuations, the system varies power consumption by adjusting the compressor speed to optimize energy usage. The variable-capacity indoor units are controlled by electronic expansion valves. This feature allows operation only at the levels required to maintain a consistently comfortable indoor environment without wasting energy. Simultaneous operation CITY MULTI systems provide simultaneous cooling and heating operation in fall, winter, and spring when the temperature drops below'65'E So there is a significant number of days when the CITY MULTI R2-Series takes advantage of simultaneous operation, while maximizing comfort. This innovation results in virtually no energy wasted by being expelled outdoors. This special function results in optimum energy usage. Year-round energy savings CITY MULTI R2-Series VRFZ Systems provide continuous energy savings. During warm weather the CITY MULTI R2- Series VRFZ Systems will deliver the precise amount of cooling to the zones requiring cooling. During cold weather, R2-Series VRFZ System provides outstanding heating performance because of the high-speed capabilities of the inverter-driven compressor in the outdoor unit. Most of the year, CITY MULTI R2-Series VRFZ Systems operate in partial-load conditions, and the inverter-driven compressor runs only at the speeds necessary to provide the required amount of cooling and heating. Using the same refrigerant circuit, the system provides true zoning configuration by heating one or more zones, while simultaneously cooling one or more additional zones. The total applied capacity of the CITY MULTI R2-Series VRFZ System's indoor units can be up to 150% of the capacity of the outdoor unit by taking advantage of load diversity and simultaneous cooling/heating operation. CITY MULTI VRFZ Systems are able to satisfy a significantly higher building load by efficiently distributing the capacity to the outdoor unit and indoor units while using much less energy. 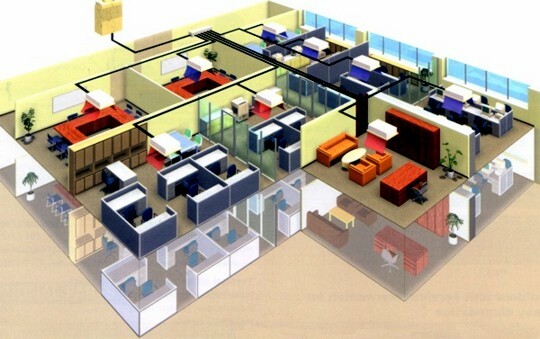 On-demand simultaneous cooling and heating Enhanced comfort and energy savings. Each zone, regardless of sun exposure or utilization, will remain truly comfortable. CITY MULTI R2-Series uses a two-pipe system and a BC Controller to cool and heat different zones in the same building simultaneously. 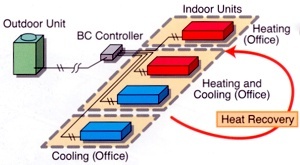 Simultaneous Cooling and Heating R2-Series Outdoor Unit and BC Controller Connects Up to 20 Indoor Units. CITY MULTI from Mitsubishi Electric delivers precisely the cooling and heating needed at any time. How? Our inverter-driven compressor technology and our exclusive BC Controller make two-pipe simultaneous cooling and heating possible. As indoor and outdoor temperatures fluctuate, the system automatically adjusts the compressor speed to react immediately and deliver the exact amount of refrigerant - no more, no less - thereby maintaining a comfortable interior environment while saving energy. At 39" x 33" CITY MULTI R2-Series outdoor units offer one of the smallest footprints in the industry for a 108,000 Btu/h outdoor unit. An added advantage is the vertical-discharge design, which allows outdoor units to be installed side by side in a single area, saving space and resources when multiple units are involved. The outdoor unit's four-digit display speeds up the service process by providing a fault code and history. It also allows over 250 items of operation information to be displayed. In many ways, the BC Controller is the technological heart of the CITY MULTI R2-Series. It works in unison with the outdoor unit to provide simultaneous cooling and heating, something no other two-pipe system can do. 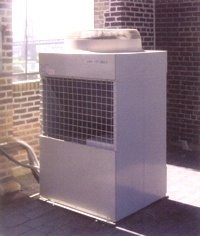 The BC Controller is connected to the outdoor unit by two pipes and to each indoor unit by a series of two refrigerant pipes, depending on the indoor unit count. 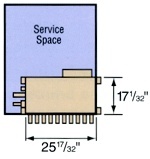 The BC Controller is required for all CITY MULTI R2-Series installations. BC Controllers come in 5, 6, 8, 10, 13, and 16-branch options. The BC Controller you select depends on how many indoor units will be operated from each outdoor unit and your total capacity requirements. The R2-Series system offers flexibility and reduced costs for refrigerant piping. The system may have a total combined length of refrigerant piping up to 1,312 feet one way. One inverter compressor is all you need. The CITY MULTI R2-Series offers the ultimate in freedom and flexibility. Cool one zone while heating another. Set up zones to maximize simultaneous operation: interior/exterior or eastern exposure/ western exposure. Each zone gets the cooling or heating that’s needed at any time. CITY MULTI R2-Series Variable Refrigerant Flow Zoning (VRFZ) System from Mitsubishi Electric’s HVAC-Advanced Products Division offers you the ultimate in enhanced comfort and effective energy usage. Mitsubishi Electric’s CITY MULTI R2-Series outdoor unit uses inverter-driven compressor (Variable Frequency Drive) technology to provide highly responsive cooling and heating performance. By responding to indoor and outdoor temperature fluctuations, the system varies power consumption by adjusting the compressor speed to optimize energy usage. 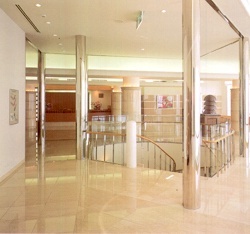 The variable-capacity indoor units are controlled by electronic expansion valves. This feature allows operation only at the levels required to maintain a consistently comfortable indoor environment without wasting energy. Simultaneous operation CITY MULTI systems provide simultaneous cooling and heating operation in fall, winter, and spring when the temperature drops below’65’E So there is a significant number of days when the CITY MULTI R2-Series takes advantage of simultaneous operation, while maximizing comfort. This innovation results in virtually no energy wasted by being expelled outdoors. This special function results in optimum energy usage. Year-round energy savings CITY MULTI R2-Series VRFZ Systems provide continuous energy savings. During warm weather the CITY MULTI R2- Series VRFZ Systems will deliver the precise amount of cooling to the zones requiring cooling. During cold weather, R2-Series VRFZ System provides outstanding heating performance because of the high-speed capabilities of the inverter-driven compressor in the outdoor unit. Most of the year, CITY MULTI R2-Series VRFZ Systems operate in partial-load conditions, and the inverter-driven compressor runs only at the speeds necessary to provide the required amount of cooling and heating. Using the same refrigerant circuit, the system provides true zoning configuration by heating one or more zones, while simultaneously cooling one or more additional zones. The total applied capacity of the CITY MULTI R2-Series VRFZ System’s indoor units can be up to 150% of the capacity of the outdoor unit by taking advantage of load diversity and simultaneous cooling/heating operation. CITY MULTI VRFZ Systems are able to satisfy a significantly higher building load by efficiently distributing the capacity to the outdoor unit and indoor units while using much less energy. CITY MULTI from Mitsubishi Electric delivers precisely the cooling and heating needed at any time. How? Our inverter-driven compressor technology and our exclusive BC Controller make two-pipe simultaneous cooling and heating possible. As indoor and outdoor temperatures fluctuate, the system automatically adjusts the compressor speed to react immediately and deliver the exact amount of refrigerant – no more, no less – thereby maintaining a comfortable interior environment while saving energy. At 39″ x 33″ CITY MULTI R2-Series outdoor units offer one of the smallest footprints in the industry for a 108,000 Btu/h outdoor unit. An added advantage is the vertical-discharge design, which allows outdoor units to be installed side by side in a single area, saving space and resources when multiple units are involved. The outdoor unit’s four-digit display speeds up the service process by providing a fault code and history. It also allows over 250 items of operation information to be displayed.